In any transformation, a question: How to get buy-in—and thrive? It’s a question every business transformation offers (or presses upon) every leader: How can we help our employees buy into the plan—and then thrive? Whether the transformation is inspired by strength or compelled by vulnerability, the core answer is the same for every employee: she wants to believe in the organization’s purpose, belong to a team of people helping one another soar, and trust that she matters to the organization in two ways: she makes a difference and she feels valued. In my experience, communications plays a major role in creating an environment of “believe, belong and matter”—and then magnifying its productive power. From 2006 to 2011 I led Employee Communications at Intel, and my team and I used the framework of “believe, belong and matter” to drive our programs and messaging. I can’t prove it, but my bosses, teammates and I would say it was effective. So, how do you create a “believe, belong, matter” environment in your organization? What do you actually do? Whether you’re a leader, a manager, or a communications professional, the most important action is to begin thinking in terms of believe, belong and matter. When we regularly ask ourselves, “How can I help our employees believe, belong and matter?” our answers give us all kinds of guidance about decisions, actions, messages and tone. This framework can inform not only communications planning but training and development, policy formation and business decisions as well. It can be applied as part of any other discipline, theory, model or mindset. Will this move be easy or hard for employees to understand in terms of our goals? Are we asking employees to do new things, or to apply current skills to new opportunities? Will this step make employees instinctively more proud of our company, or initially less proud? After the transition, will the organization be even more like it is today, or dramatically different? Are leaders and managers prepared to help every single employee understand how her role will help the new approach succeed? Each answer will affect how your employees—your human colleagues—will believe in the organization’s purpose, feel they belong to a mutually supportive community, sense they matter to the organization’s success and feel valued. The answers don’t have to be happy ones. Life and work are full of difficult decisions with tough actions that aren’t comforting or comfortable. In fact, bad news and how you handle it can be great opportunities to strengthen trust and confidence. 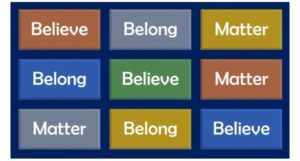 The “believe, belong, matter” framework isn’t about cheerful talk or false paradises. It’s about recognizing that organizational strength and business momentum depend on employees who understand and commit to the company’s goals, trust their leaders and colleagues, feel their contributions make a difference and feel appreciated. But back to the question: What to actually do? Consider everything. In all you communicate, from the CEO’s strategy presentation to the transition timeline, from vacation policies to fire drills and cleaning schedules, think about “believe, belong and matter.” Use it as a filter, a lens. Watch for opportunities to reinforce the environment in positive ways. You can start anywhere, go in any order: A hallway conversation can begin with specific appreciations and extend to strategy and direction. An arena presentation might begin by offering reasons for confidence in the strategy and then shine a light on the power of collaborative teams. It’s complex—but full of opportunity. Understand that “belief” isn’t only about business strategy, “belonging” isn’t just about trust and familiarity, and “mattering” isn’t just about job roles and benefits. To believe in a company I also have to feel it treats employees fairly. To feel I belong here, I have to believe in the company’s strategy. To matter, I have to trust my manager as she guides and recognizes my work. All of these cross-influences make things more complex, but they also increase the number of opportunities for positive momentum. Partner well. If you’re a communications professional, appreciate the limits of communications—and become close partners with human resource colleagues and business leaders. Each on her own can do a lot, but not nearly as much as you can do together. And the most important aspirations—the higher aims of “believe, belong and matter”—can’t be reached without coordinated and mutually supportive efforts to plan, to execute, to measure, to adjust, and to plan and execute again and again. Don’t talk about it—live it. In my experience, talking publicly about “believe, belong and matter” isn’t a good idea, just as declaring that you’re a trustworthy person doesn’t inspire confidence. It’s better if the “believe, belong, matter” framework is kept inside the communications and leadership teams, as the framing for other action and communication. It’s not that the framework is embarrassing or confidential. And certainly these three words needn’t be banned; they can be effective parts of the communications. But be careful: without the right context and commitment, the words can sound hollow, preachy, or misty-eyed. Leverage leaders’ different strengths. Some executives and managers are terrific presenters and speech-makers on a big stage. Some are much more effective in small groups where quiet dialogue happens. They also have different experiences, stories, modes of listening and expression. Make good use of those diverse strengths. Build matrices (on whiteboards or in your head) of how those human leaders can best connect with your human employees in various settings, situations, timings, and communication modes. Thriving in a transformation? It’s about helping employees believe, belong and matter. And nearly everything can become part of the multifaceted effort to get there. This post is adapted from the book “Aiming Higher: Helping Employees Believe, Belong and Matter in Your Organization,” available on Amazon. Next Next post: I was shocked by this survey question. My wife wasn’t.